"Don't look at me like that. 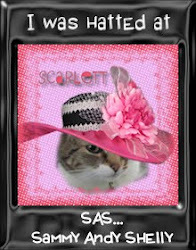 I would never attack Scarlett's tantalizingly swishy tail." Naturally, Scarlett is NOT deliberately swishing her tail! Must. catch. tail. You know she just can't stand it! So cute. Miss Melly you are seriously adorable! 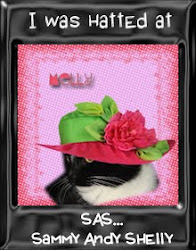 Miss Melly, you know that Miss Scarlett is just going to give you a look that will curl your whiskers if you try to swat her tail. Invasion of the Furry Beasties!